Mark Evans and Justin Mortelliti have cause to celebrate right now. The couple recently got engaged and both guys are making their Broadway debuts—Mark makes his debut as Chris Bean in the Tony and Olivier Award-winning comedy The Play That Goes Wrong, and Justin is in the ensemble and understudying the lead in the new Jimmy Buffett musical Escape To Margaritaville. 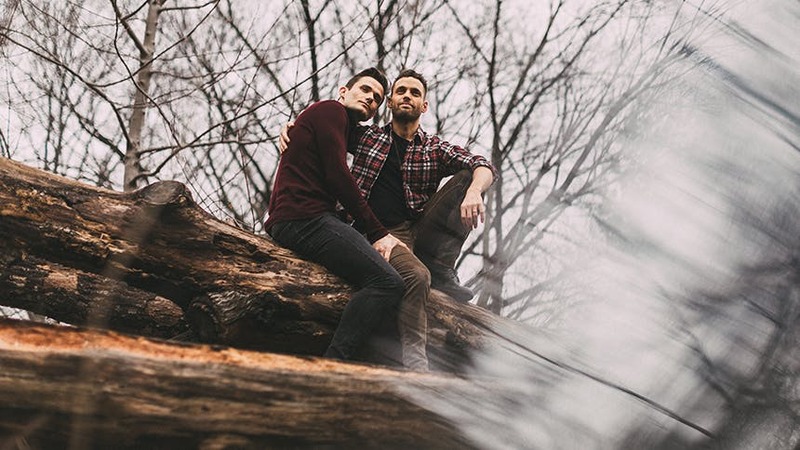 BroadwayBox caught up with the handsome pair to hear from each of them about falling in love, career milestones, nights off together, and more. Mark and I were introduced on Facebook Messenger by his best friend, Rebecca Faulkenberry. Because I was in Vegas at the time doing Rock of Ages, we had to meet on our iPhones. My first impression was that he was witty and a joker, based on his messages via text. And that he was handsome as hell, based on his face via FaceTime. But when he flew out to Vegas to meet me a few weeks later, after having an emergency appendix surgery the night before, my first impression was definitely, ‘Wow, this guy is something special’. See above! I’m kidding. Very early on I had the feeling that this was the real deal. There were definite moments I remember thinking, “I hope this doesn’t go south for some reason because I really love this guy,” but I think it was the time he flew home to be with me at my brother’s wedding in Wales and met all my family and friends in the UK. I felt such immense pride introducing him to everyone at home and it felt great watching them all get to know him and start to love him too. That’s when I saw a real long term future for us and it felt so right. After getting to know his kind heart I would catch glimpses all the time of how he was hubby material. But I’ll never forget one morning he let me sleep in and got up to walk my dog, Dio G. (now OUR dog). When I woke up, he was making coffee and breakfast to bring to the two homeless men he met in the park near our apartment while he was walking the dog. That’s when I knew this was the kind of man that I wanted to be with forever. I am the first to admit that I find talent extremely attractive –We all do right?! –so when I watched him play the lead role of Drew in Rock Of Ages in Las Vegas on the first day that I got there my thought was, “Oh thank goodness, he’s actually really awesome in the show,” as I sat there with a smug look on my face in an audience full of gamblers, drunks and regret. “He’s mine” I thought and politely sipped my $20 bottle of Corona. Every time I see Mark on stage he just blows my mind. The first performance I saw him in was Singin’ in the Rain and he was just flying around that stage, his dancing was crazy good, I was so impressed. Not to mention that voice. Geeeeez, he’s unbelievable. But my favorite was his Broadway debut in The Play that Goes Wrong. To see him in a play, rather than a musical, and to see how funny he was and how grounded in reality he was at the same time just made me so proud and excited for him. It was a really special moment. Now that I’ve gotten to know the cast of The Play That Goes Wrong through Mark, I get to see and really appreciate the fun that they are having with each other in the show. I catch new moments that I love every time I see it. But the moment that makes me laugh out loud every time is when Mark gets whacked in the face with the shield. I was actually in back in the UK when he called to tell me he had finally received the official word that Broadway was definitely happening for him and I remember feeling each of those 3,500 miles between us. I was so happy and proud and just wanted to celebrate with him. We had a dinner at our favourite restaurant where we live in East Harlem once I returned. It’s a place we only eat when one of us books a job! Well, we were in La Jolla, California together. Mark flew out there to visit me while I was working on Escape to Margaritaville. It was my day off so we had a fun beach day with the dog. Mark got the call while were in an uber on our way back to my apartment. We contained ourselves as much as possible in the car but as soon as we got to my place I started screaming and jumping up and down, running around the apartment. Then we poured ourselves a drink and went and jumped in the pool. We have a tradition that when we book a new job we have dinner to celebrate at our favorite neighborhood restaurant in East Harlem called Nocciola. We made sure that we did that when I got back to NYC. Actually just chill on the sofa with a bottle of wine, some good food—which usually primarily consists of cheese (never had I eaten as much cheese before dating an Italian from South Jersey) with a TV show or movie and our amazing little dog Dio. G.
We love to cook a good meal, pour ourselves a glass of wine and get in some good couch cuddling time with our favorite TV show or a movie. Especially when our schedules are so busy, time at home together is sacred. The mutual respect, patience, support, encouragement, and most of all understanding. It’s a tough industry at times and other times it’s joyous and having someone to share all of that with makes it all the more worthwhile. Besides the consistent understanding and compassion for the crazy schedule that goes along with being an actor and the unpredictable jobs that take you out of town, it’s the support we give one another. Being with another actor who understands the difficulties of the business, the very high-highs and very low-lows, is invaluable. We are an extremely strong support team for one another. I think the two of us together make for a very strong team. I’m proud of that. We’re both very passionate about what we do so the challenges are just accepted as part of the parcel but I suppose the occasional lack of consistency or stability can be a little testing. But that’s for actors in general and not necessarily a relationship problem. For the two of us to be making our Broadway debuts at the same time, on the same street, on opposite sides of Times Square from each other is a blessing and we are going to enjoy this stability and structure for however long it lasts before moving on to the next adventure. The unpredictability. You always have to be ready for whatever comes your way. It’s nice to make career decisions together now, but there is definitely a lot of sacrifice. We have to always make sure that our relationship is always a priority and to not get too caught up in the work. Hopefully planning a wedding with this unpredictability doesn’t have us tearing out our hair. Oh I just adore The Light In The Piazza. Adam Guettel’s score is possibly the most romantic and sweeping I’ve ever heard. The story is full of such pure and innocent love between two wonderfully open hearted, young people. The joy that comes from their discovery of each other despite the language barrier proves that love can exist anywhere and everywhere and that finding a connection to another human is, in my opinion the most incredible gift one can be fortunate enough to receive in life. Anything Shakespeare. There’s so much romance in Shakespeare’s work that it’s hard to say what’s the most romantic play. Just the language alone and words he would use are so beautiful. I’m a hopeless romantic at heart, born that way I can’t help it, and I wish people would still speak the way he wrote… even if I had trouble understanding them sometimes. Also, I will say that ‘I’ll Cover You’ from RENT is my favorite love song from a musical. The romance in that single line ‘live in my house, I’ll be your shelter’ gets me every time. See Mark Evans in The Play That Goes Wrong & then go down the street to the Marquis Theatre to see Justin Mortelliti in Escape To Margaritaville.